Over time, understanding of lasers has grown, eventually making them accurate and safe enough for certain dental procedures. Lasers have been used in dentistry since around 1990 to treat a number of dental problems, even if many Dental Associations haven't determined whether lasers provide results that are better, worse or the same as results obtained from traditional dental tools. The potential for laser dentistry to improve dental procedures rests in the dentist's ability to control power output and the duration of exposure to the tissue whether it is gum or tooth structure. Many different types of lasers can now be found in dentists' offices, allowing dentists to perform a wide variety of dental procedures they otherwise may not be capable of performing. When a laser is used for a surgical procedure or a cavity preparation, it acts as a cutting instrument or a vaporizer of tissue that it comes in contact with. When a laser is used for "curing" a filling, it helps to strengthen the bond between the filling and the tooth. When the laser is used in teeth whitening procedures, it acts as a heat source and enhances the effect of tooth-bleaching agents. Cavity detector : Low intensity dental lasers may be used for the early detection of cavities. Cavity preparation : Lasers are used to remove decay within a tooth and prepare the surrounding enamel for the filling. Moreover, lasers are capable of killing bacteria located in a cavity, potentially leading to improved long term tooth restorations. Dental fillings : Lasers are also used to "cure" or harden a filling, by helping to strengthen the bond between the filling and the tooth. Tooth sensitivity : In case of tooth sensitivity, lasers can be used to seal the dentinal tubules that are responsible for hot and cold tooth sensitivity. Root canal procedures : Lasers can be used to remove bacteria during root canal procedures. Gum lift : Lasers can be utilized to accurately reshape the gum tissue around teeth, improving the appearance and making the smile more aesthetically pleasing (see gum lift). This procedure can also be used to expose more of the tooth's structure and thus provide a stronger foundation for the placement of a restoration, such as a crown or a bridge (this procedure is also known as crown lengthening). Frenectomy or the removal of the frenula : A laser frenectomy is an ideal treatment option for children who are tongue-tied or have a limited tongue movement ability. The operation may also help to eliminate speech impediments. Soft tissue folds : Dental lasers may be used for the painless and suture-free removal of soft tissue folds (also known as epulis) often caused by ill-fitting dentures. Tumors : Dental lasers may be utilized for the painless and suture-free removal of benign tumors from the gums, palate, sides of cheeks and lips or to remove a small piece of tissue (called a biopsy) so that it can be examined for cancer. Teeth whitening : Low intensity dental lasers may be used to speed up the bleaching process associated with teeth whitening. For example, a peroxide bleaching solution applied to the tooth surface is activated by laser energy, which speeds up the whitening process. Temporomandibular joint treatment : Dental lasers may be used to quickly reduce pain and inflammation of the temporomandibular jaw joint. 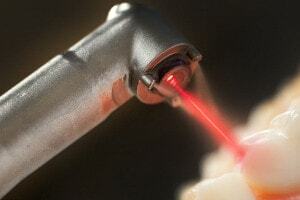 Lasers may reduce anxiety in patients that are uncomfortable with the use of the dental drill. Dental lasers minimize bleeding and swelling during soft tissue treatments as the high-energy light beam aids in the clotting of exposed blood vessels. Wounds heal faster, as the recovery times from this type of dental work may be shorter and less uncomfortable. Damage to surrounding tissue is kept to a minimum. Some laser procedures still require anesthesia. Lasers cannot be used to prepare and fill cavities located between teeth. Some of the cavities that can be cleaned out with lasers usually need further work with a drill, since most tooth decay ends up in spots that are tough to accurately reach with a laser. Traditional drills are still needed to shape the filling, adjust the bite, and polish the filling even when a laser is used. Lasers cannot be used to remove defective crowns, silver fillings, or prepare teeth for dental bridges. The big concern is that the heat from a laser will release mercury vapors or overheat areas where metal base crowns are in place. Laser treatment is much more expensive than traditional methods. This is because the cost of a laser is much higher than a dental drill. As the applications for dental lasers expand, greater numbers of dentists will probably use the technology to provide patients with precision treatments. While the future looks bright for the use of lasers in dentistry, for now, it is advisable to continue to do your research before deciding if one of these procedures is right for you.